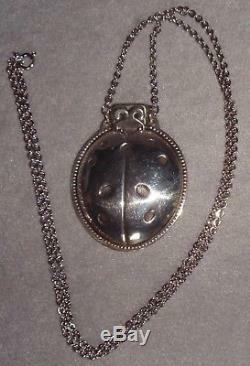 VHTF Reed Barton Sterling Lady Bug Whistle Pendant. 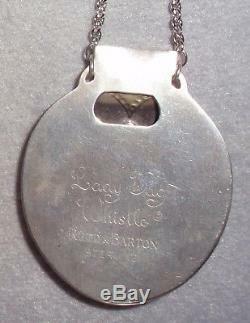 Very hard to find Lady Bug whistle by Reed & Barton is in nice vintage condition. Large, shrill, working whistle is finely crafted in sterling silver in a puffy front bug form complete with spots. 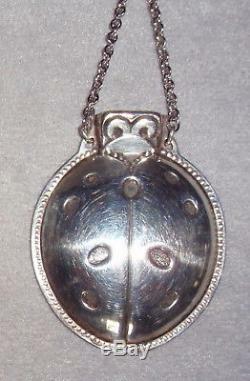 Two inch long dimensional front is complete with the original sterling chain, and a flat back imprinted Lady Bug Whistle; Reed & Barton; Sterling. Great for personal safety too! This is in nice vintage condition but does not include the original pouch, box or romance card. There are faint scratches on the back consistent with use and polishing, one slight ping, and the mouth portion looks to be slightly pushed in. Even though not intended as Christmas Ornaments, these hard to find whistles are a popular choice for ornament collectors Xmas trees. Any gold tones or spots you may see are the result of poor photography, this is gleaming sterling silver. As with all vintage silver, may require proper polishing upon receipt depending on your preferences. American Folklore: If you find a Ladybug hibernating in the house, you will have good luck. If a ladybird lands on your hand and flies away unassisted, you will receive good luck. Canadians say that if a Ladybug lands on you, make a wish and when it flies away, the wish will come from that direction. This is when they sing the rhyme, Ladybug, Ladybug, Fly away home. If by some small chance your item is not satisfactory, your return should still be received within 7 days or less. The item "Reed Barton Sterling Silver Lady Bug Whistle Christmas Ornament Pendant Gift" is in sale since Tuesday, February 13, 2018. This item is in the category "Collectibles\Holiday & Seasonal\Christmas\ Modern (1946-90)\Ornaments\Metal". The seller is "dkoldtiques" and is located in Barry, Illinois. This item can be shipped worldwide.